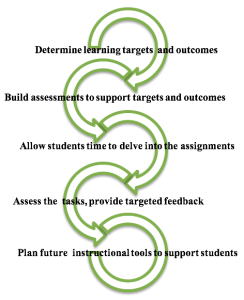 Formative assessment (for learning) must be ongoing, varied, and central to the instructional-learning cycle. 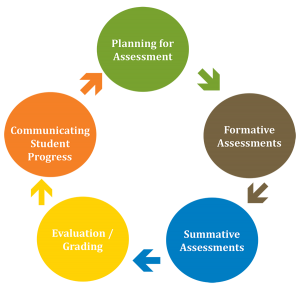 Assessment for learning (formative assessment), designed to improve learning and achievement, occurs throughout the instructional cycle. It does not involve grades and scores for assignments and tasks but instead turns assessments into learning events. Formative assessment provides opportunities for students to clarify their understanding prior to grading or scoring while not impacting final grades or scores. The focus of formative assessment is to provide students targeted feedback, during the unit of study, to guide students with the next step of their learning. To assess where students are, what they still need and where they need to go in their learning, requires multiple and varied assessments throughout the unit. Assessment for learning is “designed to give teachers information to modify and differentiate teaching and learning activities. It requires careful design on the part of teachers so that they use the resulting information not only to determine what students know, but also to gain insights into how, when, and whether students apply what they know. Teachers can also use this information to streamline and target instruction and resources and to provide feedback to students to help them advance their learning”. (Western and Northern Canadian Protocol for Collaboration in Education (WNCP), 2006, pp.13–14). 2) Conference with students about their learning and plan the next steps together. 3) Provide rubrics to students to enable them to see where they need to be. See here for more descriptions and examples. 6) Provide clear, descriptive, honest and supportive feedback – focus specifically on learning. Watch as Dylan Wiliam reviews the nature of formative assessment and how teachers can use it to gain better insights into student learning and achievement. Should you tell your kids they are smart or talented? Professor Carol Dweck answers this question and more, as she talks about her groundbreaking work on developing mindsets. She emphasizes the power of “yet” in helping students succeed in and out of the classroom. Brookhart, S. (2008). How to give effective feedback to your students. Alexandria, Virginia. Association for Supervision and Curriculum Development. Crockett, L. & Churches, A. (2017). Mindful assessment: The 6 essential fluencies of innovative learning. Bloomington, Indiana. Solution Tree Press. Shepard, Lorrie A. “The Role of Assessment in a Learning Culture.” Educational Researcher 29, no. 7 (Oct 2000): 4:14. Moss, C. & Brookhart, S. (2009). Advancing Formative Assessment in every classroom: A guide for instructional leaders. Alexandria, Virginia. Association for Supervision and Curriculum Development. Western and Northern Canadian Protocol for Collaboration in Education. (2006). Rethinking Classroom Assessment with Purpose in Mind.